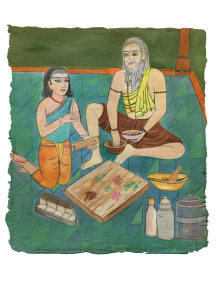 What are the Vedic medicinal fields? In Vedic times, the living sciences of extraordinary medical discoveries took human health and longevity to unimaginable levels. Vedic tradition is the spiritual root of all medical, biological and mental health and life sciences, which approached the human mind-body as a microcosm of the universal energy and not as a separate bio-chemistry.The vedic tradition prescribes three ways for extraordinary powers to express through you that lead you to enlightenment. They are: mani, technique or technology such as flying machines; mantra, sacred sounds and aushada, special herbs or chemicals that raise the consciousness. The Master’s initiation can instantly give enlightenment or awaken extraordinary powers in you, but the human system is not prepared to hold that cosmic energy. It is like pouring water on an inverted pot. The sacred herbs when energized and given can simply open the human mind-body’s nervous pathways to receive the powerful transmission by the Master. Ayurveda is the most ancient science of living and longevity. Siddha gives extraordinary cures for diseases along with mystic yogic powers and wisdom. It has produced the largest number of enlightened miracle-makers in the world. Naturopathy is naturopathic medicine.Varma is the holistic healing science of human nervous system, where vital points act as energy transformers or batteries. Siddha and Ayurveda medicines are the mediums for extraordinary powers of the mind, body and being, besides holistically curing ailments. Mystic powers such as physically appearing and disappearing, materializing sacred herbs and using medicinal plants to cure any kind of disease were made into practical and usable medical sciences. From the space of advaita or oneness with plants and the elementary forces of nature, these divine physicians allowed nature to reveal its healing properties and powers. Widespread epidemics were healed just by the pranic powers (powers of life energy), where the vedic physicians would breathe in the infected air or spread rare herbs to heal the atmosphere and the living beings.